A situation you may come cross is that one of you drive is full while the other is empty. Can I transfer free space from empty partition to full one? Fortunately, there are ways to solve the problem. You have a 24 GB drive which has been divided into partition C: and D: . However, due to the daily increasing data, the free space of your C drive is 4 GB. While D drive has 10GB. You have the habit of storing data on a fixed partition. Day after day, the size of unused space will be unbalance. You partition for your new computer and you are satisfied with the size of each partition. But, after a long time you realize the free space between partitions is extremely unbalance. The direct way to solve the problems mentioned above is to increase the size of C drive. But what is the method? Fortunately, there are methods to solve the problem and it is transferring your free space to anther to extend the drive. How to Transfer Free Space from One Drive to Anther? Disk Management is a built-in tool in Windows Server which can help the users to manage their partitions. 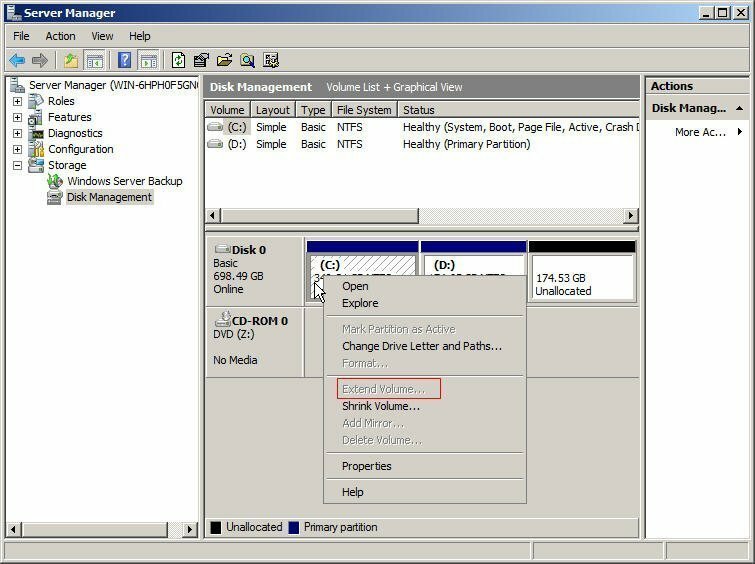 For Windows Server 2008 and 2012, the built-in Disk Management can extend or shrink volume, but sometimes you will find the Extend Volume grayed out because this feature is only available when there is unallocated space next to the partition which you want to expand. In additional, for the users of Windows 2000/2003 Server, there are no "Extend and Shrink" features in built-in Disk Management and Diskpart.exe doesn’t support extension of boot and system partition. Therefore, those users can’t use the tool, only the third-party software can help them solve the problem. This is a kind of partition manager server software especially for Server users; it can help you allocate free space, convert dynamic to basic disk, resize partition and more. All the features can be supported by Windows 8, Windows 8.1, Windows 7, Vista, Windows Server 2003, 2008, 2012 R2. Compared with Disk Management, there is no limitation for its feature of Extend Partition and it support Windows Server 2000, 2003, 2008. It can be widely used by the Server users. How to Use AOMEI Partition Assistant Server? You can only allocate the free space from one partition to another. Besides, the allocated space should be less than or equal to the unused space of source partition in size. If there are other applications running on the partition which you are going to perform, AOMEI Partition Assistant will notice you to close those applications by click “Retry” (it is also the recommended option) or to execute this operation in PreOS Mode by choosing “Restart Now” (Your computer will restart if you press this button) or just to click “Cancel Operations” to finish this operation by rebooting your computer and redoing it without opening those applications. Step1, download, install and launch the software. Right-click D drive and then select Allocate Free Space. Step2, type the size of free space which you want to transfer from D drive to C drive, and click OK. You will see the free space has added to C drive. Then click Apply to proceed your operations. From the steps mentioned above, you can learn how to transfer free space to anther partition clearly. In a word, its powerful features can demand nearly all the needs of Server users. You can have a try.